As Shakespeare and the Globe Theatre are to literature, the composers of The Chapel Royal and The Chapel Royal are to music. The newly established Choral Foundation, The Chapel Royal, Hampton Court Palace, a UK registered charity, announced the launch of a fundraising campaign to raise £1.5 million to secure the future of the rich musical heritage of the Chapel Royal, Hampton Court Palace. The Choir to date has been largely self-funded through donations from the congregation but due to growing expenses, funding is now insufficient to sustain the Choir. The Choral Foundation: Aims and Aspirations: The Choral Foundation was created to ensure that worshippers and visitors continue to have the opportunity to experience the musical heritage of the Church of England at Hampton Court Palace. The Choral Foundation will raise money to fund the musical training of the Choir boys, to establish scholarships with local schools for boys who would otherwise not be able to enter the Choir and attend these schools, to undertake major repairs on the historic organ to bring it back to world class standard, and to fund professional Gentlemen singers so they can practise and perform regularly with The Chapel Royal Choir. A fully funded choir guarantees performance of the highest standard and will enable the choir to widen its outreach both locally and nationally by accepting more concert offers and recording opportunities. Over one third of Target Reached Already: The fund-raising drive has already captured people's imaginations - even before the official launch, the newly established Choral Foundation has raised over one third of its target. The Choral Foundation is seeking to raise the remaining funds from the general public, businesses, trusts, philanthropists, friends of the Chapel Royal, and through legacies. The Chapel Royal has been called “the cradle of English church music”. From the 16th century renowned composers and musicians performed for Henry VIII, Edward VI, Queen Mary I, Queen Elizabeth I, James I, Charles II, William III and Mary II, and Queen Anne. These composers included William Byrd, Thomas Tallis, Orlando Gibbons, Thomas Morley, Henry Purcell, Pelham Humfrey and John Blow. The musicians and composers of The Chapel Royal inspired and were copied by cathedrals, churches and chapels throughout the country. The tradition of musical excellence continues today: the choir regularly performs works by living British composers such as Sir Nicolas Jackson, Sir Peter Maxwell Davies, James McMillan and Jonathan Dove. The Right Reverend and Right Hon. Dr Richard Chartres, KCVO, Bishop of London and Dean of Her Majesty’s Chapels Royal, the Chief Patron of the Choral Foundation, spoke about the importance of keeping the choir and the heritage of English church music alive: “The Choir of The Chapel Royal, Hampton Court Palace, has been enriching the cultural and spiritual life of England for nearly five hundred years. As Shakespeare and the Globe Theatre are to literature, the composers of The Chapel Royal and The Chapel Royal are to music. Looking back on the centuries of fine music emanating from The Chapel Royal, we recognise the Choir’s enormous contribution to the heritage of English Music. A Musical Heritage Open to All: The Choral Foundation also wishes to raise the profile of The Chapel Royal at Hampton Court Palace as a church and worshipping community. Many people are unaware they can worship at or visit the chapel. Canon Denis Mulliner, Chaplain of The Chapel Royal, stated: “The public are most welcome to attend the services on Sunday and Holy Days; worshippers do not pay the Palace entrance fee. The Chapel Royal is a hidden treasure, a living, vibrant church with an outstanding choir at the centre of an historic royal palace. We would like to share this with as many visitors as possible and we warmly welcome those who may wish to join our congregation." To Support the Choral Foundation, please visit www.chapelroyal.org. To keep up to date with the Choral Foundation activities follow at https://twitter.com/#!/HamptonCPChoirand http://www.facebook.com/ChapelRoyal?sk=wall. 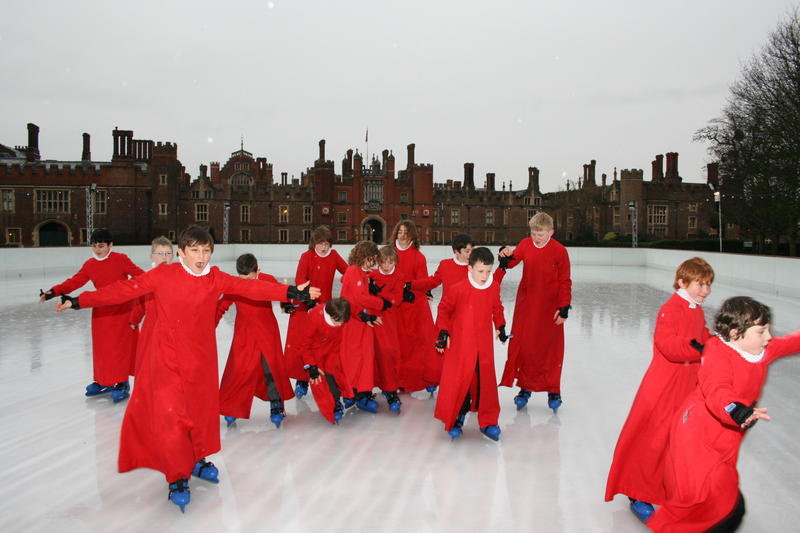 The Choral Foundation and the fundraising launch took place on 4 December 2011 in The King’s Guard Chamber at Hampton Court Palace following a special Evensong to celebrate the 400th anniversary of the Authorised Version of the Bible and was attended by over 200 supporters. Among the guests were The Right Reverend and Right Hon. Dr Richard Chartres, KCVO, Bishop of London and Dean of Her Majesty’s Chapels Royal, Patron of the Choral Foundation, Elizabeth the Lady Maclean, Co-Patron and Lord Watson of Richmond CBE. Also present were Councillor Clare Head, Mayor of the Royal Borough of Richmond, Ray Warner, President of the Richmond Chamber of Commerce and Michael Day, Chief Executive of Historic Royal Palaces. Guests also included descendants of the famous composers John Blow and Henry Purcell, who were Children and Gentlemen of the Chapel Royal and both performed and composed as part of The Chapel Royal musical establishment at Hampton Court Palace. This press release was distributed by ResponseSource Press Release Wire on behalf of Fortune PR in the following categories: Entertainment & Arts, Leisure & Hobbies, Women's Interest & Beauty, for more information visit https://pressreleasewire.responsesource.com/about.